An all in one convenient fan for your work site or factory is the Dynabreeze 300mm 2 in 1 blow and extract fan. Built for endurance and extended performance, this fan features a powerful 520W motor with an air delivery of 60m3 per minute and 2800 rpm. 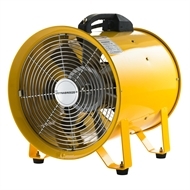 Equip with a heavy duty safety grille and anti vibration mounts, this 2 in 1 fan provides ultimate functionality and longevity for premium use on any commercial site.